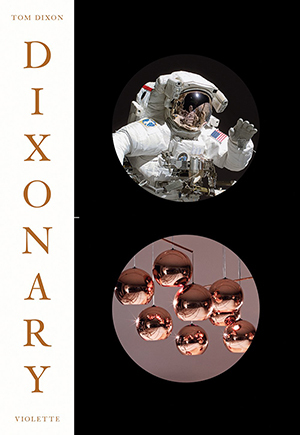 Dixonary is a comprehensive book on one of Britain’s best-known and most highly regarded product designers. In his own words, and with hundreds of comparative illustrations interleaved with text, this self-taught designer illuminates the often surprising ideas behind his finished pieces. Dixon transforms notions of plumpness observed in a painting of an overfed sow into an overstuffed sofa; or gigantic concrete sea defenses on the coast of Japan become the distinctive shape of his famous stacked Jack Light. Dixonary is, in Dixon’s words, “a simple picture book with short ‘stories’ attached–stories that present in an ordered and bite-sized way an approximately chronological sweep through the last three decades of topics and techniques that interest me and the things I have made.” A child of the punk era, Dixon (born 1959) founded his own studio in the 1980s following his discovery of the pleasures of welding while repairing damaged motorcycle frames. He became Head of Design at Habitat in 1998 before reestablishing his own brand, Tom Dixon–a lighting and furniture design and manufacturing company–in 2002. He has also been Creative Director at Artek, the Finnish furniture company founded by Alvar and Aino Aalto.